I just finished a book that I consider a “must read” for everyone at a nonprofit working in fundraising, marketing or communications. 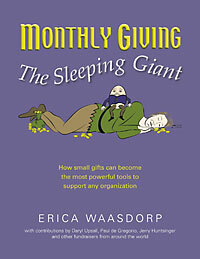 It’s called, “Monthly Giving – The Sleeping Giant” by Erica Waasdorp. She has 30-ish years of direct response fundraising experience; including 10 years leading her own agency. WHY do I consider it a “must read” for anyone serious about having a strong fundraising program? Because regardless of whether your nonprofit is small, medium or large … regardless of whether you already have a program and want to grow it or you have yet to start a monthly giving program … this book will help you. • Email, Social Media and the Internet – the importance of using a simple and unique landing page; the role of your website (remember: some 67-percent of donors check out a website BEFORE they decide to make a donation); samples of including monthly giving options on your website; Facebook giving pages; etc. • Convert single gifts to monthly donors with texting (SMS) – this method is in its infancy but do NOT overlook it; harnessing the power of cell phones and our mobile world; integrating it with other channels; etc. • Radio – don’t forget this reliable traditional channel; public radio stations are but one example of an org successful at converting members to sustainers; use of your website to make this method work; scripting; etc. Do you see now why I urge you to read this book? And for the record, this is an unsolicited endorsement. What’s more I receive zip, zero, nichts, nada for this review. She has extensive first-hand experience building and expanding sustainer programs. Read “Monthly Giving – The Sleeping Giant” and you’ll also benefit from her experience. In other words, study her book and put it into practice and your nonprofit will raise more funds. I repeat: Erica Waasdorp’s book is a “must read”. Get your copy today. More of my posts on monthly giving.